Our members have planted and maintained many gardens over the last 100 years. This activity is fun and educational for the participants, and is much appreciated by the many people who benefit from access to these gardens. Our members planted a herb garden at the Amos Wright Park, now called the Heritage Centre. We celebrated our 80th and 90th birthdays with parties in the park. These events were attended by public officials and town citizens as well as our members. This garden continues to be maintained by society members. Society volunteers take care of the flower beds, providing beauty for hospice patients, caregivers and visitors. A Daphne shrub was planted here in 2007 in memory of Past-President, Daphne Straumann. This new garden was planted at the Richmond Hill Centre for the Performing Arts in 2009. This is the most recent project for our society volunteers. Planned in tandem with the Parks & Recreation Department, the garden is our gift to the Town in memory of the horticultural contributions of Past-President Gladys McLatchy, and includes peonies that were originally in her garden. An official ribbon cutting ceremony with town officials took place at the garden during our 100th anniversary gala celebration on April 16th, 2014. Established in 2001, this garden is in a high traffic area adjacent to Mill Pond Park and contains a wide selection of perennials. 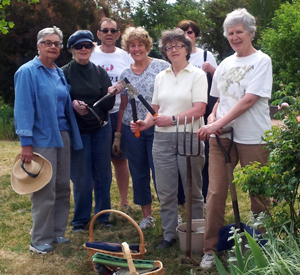 Society volunteers maintain the garden weekly through the growing season. Indoor plants are watered, fertilized, washed and pruned by our society members.